Reviews - De website van 1474457146! I feel i have to write to you all and from my hart, thank you all for at great evening, when i left for home after the concert, I felt you have given us a littel part of your hart to us trough your music! NB! when and where are you playing you 60’ years jubilie concert ? I am pleased that you all got home safely and glad that your tour was so successful. I have had a chance to talk to a number of people who came to our 'Jazz Nite' and am happy to tell you that all enjoyed your performance. 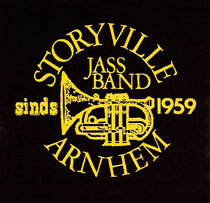 One couple said that they attend a number of live music events and often pay as much as £50 for music no where near as good as Storyville J B. It was a very good night. Well done and thank you. When you play well I look good for booking you. It was a pleasure to have you stay with us and that was said by the other two families as well. We had the opportunity to learn more about you and your band. We begin to put together the 2019 program of fund raising events in July. Our members so much enjoyed your performance last week at our Club night; very rarely do a band get a standing ovation!! I am attaching the review of the evening which will go on our Facebook page and Newsletter. Please feel free to use it when promoting your band. If you are going to be in the UK in 2020, please let me know when so that we can invite you to perform for us again. At the moment the diary for 2020 is free!!! 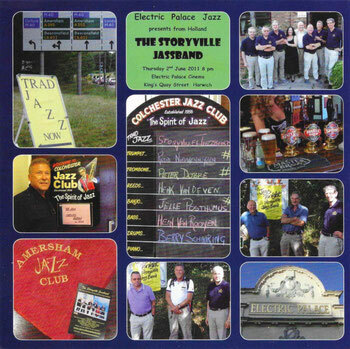 Will you please publish this review on your website: Storyville Jassband made a very welcome return visit to our club on the 29th April 2018, and gave an excellent and enthusiastic performance, this encouraged the dancing members of the club to occupier the dance floor the whole evening. At the end of the evening all our members and guests gave a rightly deserved Standing Ovation. We invited them to play again at our club during 2019. 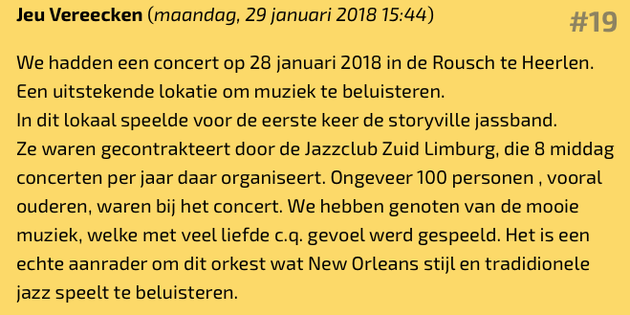 Hallo Peter het was een fantastisch en enthousiast optreden van jullie, je hebt het aan het publiek gezien, men bleef tot het laatst ondanks de frisse avond. Graag willen wij jullie weer uitnodigen voor volgend jaar ( 2019) op Koningsdag in Velp om voor ons ( het publiek) te spelen. Ik weet dat jullie in Engeland zitten en wens jullie allen een fijn optreden daar. "All the members of the club really enjoyed the performance of the band last night, a fantastic evening, which encouraged the members to dance. When you plan your next UK tour, will you please include our club within your plans; as we will be delighted to offer the band a gig on a Sunday evening." 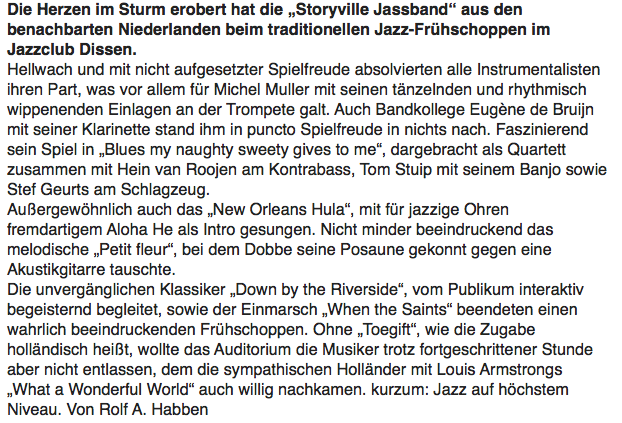 "The men of the Storyville Jassband were wonderful on Monday! The general opinion in the club was that it was the best band they had heard for many years. There was talk of a tour next year. If this happens please include Barnsley Jazz Club." "I must thank you for a truly remarkable evening of wonderful music, played by very accomplished musicians. They all provided some stunning music, studded with very entertaining and spontaneous humour which resulted in a memorable evening of first class entertainment. Our audience responded, as one would expect, with enthusiastic cheers and applause throughout the entire evening. Some new visitors signed up as club members on the strength of the performance. The evening ended up with a deserved standing ovation." "The performances from all players were superb. A band that is as established as this one has a very polished ensemble. Some of the comments from the audience I heard were “stunning”, “fabulous”, and “memorable”. Every performer was outstanding in their discipline, which gave us a plethora of superb solos. A treat came from trombone player Peter Dobbe when he took up his guitar and gave us a Django Reinhardt composition for which he received an explosion of applause from the audience. 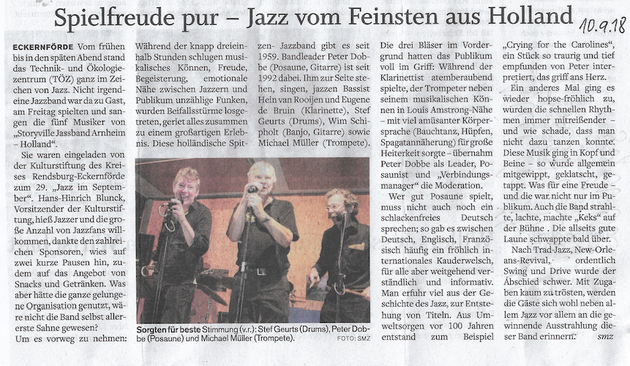 "The band went down a storm and there is no question that we shall welcome them back. Everyone cheered and shouted for more music at the end which is quite unusual with our audiences, so, yes, they were wonderful and such nice people."